Lorca in located in the region of Murcia in southeast Spain. Murcia has mountains in the northwest, 8km of coastline, and countryside covered in vineyards. Lorca itself is probably one of its most important tourist centres, and has been declared an Historic and Artistic Site because of its archaeological sites dating back to the Palaeolithic period and the wealth of important Baroque monuments in the old quarter. A 10th century gateway is one of the entrances into the ancient walled city, and here you will find palaces, churches, and convents from various different eras. The Porch of San Antonio is the best preserved of these gateways and was reconstructed by the Arabs during the 13th century. If you visit the Lorca Municipal Archaeological Museum in the historical part of town, take a look at its ornate facade before you enter. Inside there are ten rooms that will lead you through the Palaeolithic period right up to the rule of the Moors. The Plaza Mayor was the town’s main focal point, with buildings such as the Town Council, Collegiate and local prison. By the early 18th century the prison was converted into an outbuilding for the Town Council and is now the Town Hall. This square was also where regular markets were held. There is also a 16th century barn which was a Granary, where the upper floor was used to store wheat and the lower floor was a slaughterhouse. Today the building holds the town’s historical archives that are one of the best in Murcia. If you make your way through the cobbled streets to the Plaza de Espana, you will find the Ex-collegiate Church of San Patricio dating back to the 16th century. It was declared a collegiate church in 1533, and despite taking centuries to build, it is mainly Renaissance in style although the main facade is Baroque. The retrochoir was built much later during the 18th century to commemorate the Castilian victory in the Battle of Los Alporchones. The Palace of Guevara, also known as the House of Columns, is one of the town’s most stately Baroque residences and is open to the public. It was built around an inner courtyard with an impressive coat of arms over the doorway. The courtyard has a double archway at either end made of white marble, and inside the rooms are decorated with 18th century furniture with floors paved in Valencian ceramics. There is also a chapel filled with paintings and murals of that period. One of the main highlights of the palace is the Sala Chemist, which remains just as it was back in 1896 with shelves lined with original medicines and ointments. 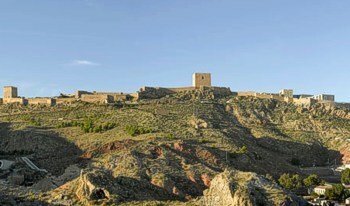 Lorca also has a medieval 13th century gothic castle known as the Fortress of the Sun. It is very long and narrow in shape with two magnificent towers; the 15th century Alfonsi Tower with its vaulted ceilings, and the Mudejar styled Espolon Tower now classified as a Monument of Cultural Interest. 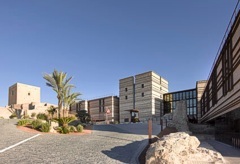 The Parador Lorca is a new build four star hotel built within the castle and is linked to part of the castle walls. One of the highlights of the Parador is the 15th century synagogue which is embedded into the hotel to prevent erosion. This beautiful hotel not only offers comfortable accommodation, a swimming pool and gym, but it also has its own restaurant serving excellent local cuisine. If you decide to visit Lorca there are many sightseeing tours available that include tickets for most of the museums, the Fortress of the Sun, the Palace of Guevara, as well as the tourist train. There are also several local festivities taking place throughout the year which of course create a very special atmosphere. So be sure to tie in your visit with one of their delightful celebrations.